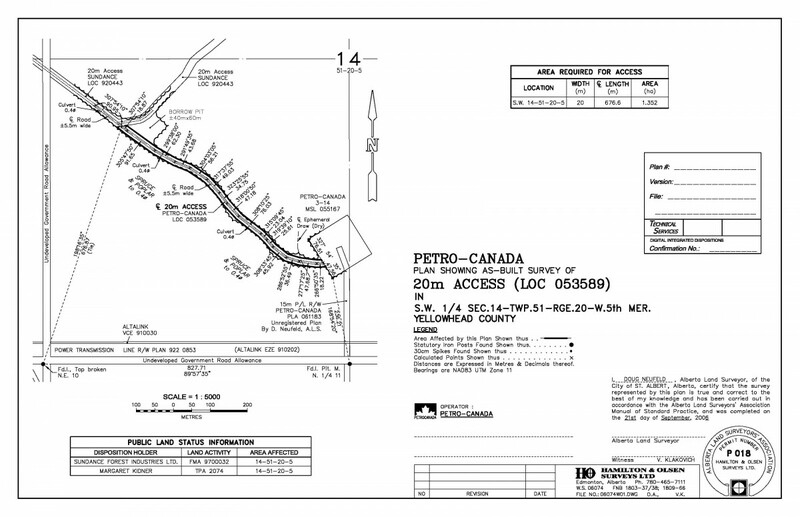 Access Roads – Hamilton & Olsen Surveys Ltd.
Access roads are corridors utilized for access to and egress from facilities or sites. They are normally of a consistent width, commencing at an existing access corridor and terminating at another access or site. Although an actual road grade is usually constructed within the boundaries of the access road, the corridor may be used for winter access, temporary access or off road vehicle access and may not be developed at all. When dispositions or leasehold parcels are created within the limits of an existing titled parcel or in crown land, rights of access to and egress from the leasehold parcel are required by the holder of the disposition. The boundaries of this access corridor must be ascertained such that a right of access over these lands can be granted to the user by the landowner (private or public). The surveying of the access road allows the preparation of a plan of survey which depicts the limits, position and area of the access within the titled parcel, quarter section or spatial reference. This “picture” of the survey then becomes the basis of the agreement between the owner of the lands being crossed and the access user. It is in the interest of both parties to have a spatially correct and accurate representation of the access road. This means the “picture” prepared by the Land Surveyor must coincide with the physical position of the access within the parcel of land it is situated. To do this, the Land Surveyor must determine, through field measurements, the relationship of the access road to both the leasehold parcel being accessed and the boundaries of the lands in which it is situated. In the surveyed areas of the Province of Alberta, the township grid complete with sections, quarter sections and road allowances generally form the limits of ownership and are defined by survey monuments placed at the time of the survey of the township. Access corridors within these lands must be tied to the defining monumentation to ensure the correct relationships are established. In the unsurveyed areas of the Province of Alberta, a theoretic township grid complete with sections, quarter sections and road allowances is used to define ownership boundaries as well. The positioning of access corridors within these lands is also achieved through survey ties to existing survey monumentation available in the immediate vicinity. These may be monuments placed by Base Line Surveys, Wellsite Control Surveys, Registered Right of Way Surveys or Alberta Survey Control Markers. The positioning of the access with respect to the disposition being accessed can only be reliable if it is physically tied to the disposition boundaries as originally surveyed and monumented. For further information on surveys of this type, you may wish to consult the Alberta Land Surveyors’ Manual of Standard Practice and Plan Requirements of the Public Lands Division of Alberta Sustainable Resource Development.